You can watch The Vampire Diaries online on a weekly basis via TV Fanatic and catch up on anything you may have missed. This is your chance to relive the most exciting moments between Delena, Stelena and all your Mystic Falls favorites. Watch The Vampire Diaries online right... now! On The Vampire Diaries Season 8 Episode 16, Elena wakes up from her coma, but does that mean Bonnie is dead? 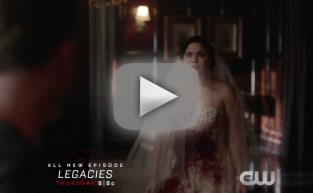 "We're Planning a June Wedding"
On The Vampire Diaries Season 8 Episode 16, a fake wedding is planned to lure Cade out of the darkness, but who returns to spice things up? "It's Been a Hell of a Ride"
On The Vampire Diaries Season 8 Episode 14, Damon and Stefan joined forces to try and make sure Elena's casket was safe from Cade. "The Lies Are Going To Catch Up"
On The Vampire Diaries Season 8 Episode 13, Kai returns and might actually hold the key to taking Cade down once and for all, but what does Stefan have to do with it? On The Vampire Diaries Season 8 Episode 12, the group will try to find a way to save Stefan's soul, but will they succeed? "You Made a Choice to Be Good"
On The Vampire Diaries Season 8 Episode 11, Cade makes a shocking decision about Caroline's future, but what will Damon do to save her? Sybil takes revenge on Damon on The Vampire Diaries Season 8 Episode 10, so Bonnie and Caroline go inside his mind. What they discover there may be the key to saving both brothers. "The Simple Intimacy of the Near Touch"
On The Vampire Diaries Season 8 Episode 9, a new Miss Mystic Falls is crowned and Bonnie returns from Paris with a gift from Enzo which causes Caroline great concern. Stefan and Damon begin serving Cade on The Vampire Diaries Season 8 Episode 8. Sybil stays behind to wreak havoc on Caroline and the rest of Mystic Falls. "The Next Time I Hurt Somebody, It Could Be You"
Damon and Sybil crash Stefan and Caroline's Christmas Eve dinner, and things quickly take a dark turn. With the help of flashbacks, Cade attempts to make Stefan an offer he can't refuse. Ready to watch The Vampire Diaries online? This drama has grown into one of the longest-running drama in CW history for a good reason: it combines suspense with sexiness, humor with intrigue. It has made Ian Somerhalder a household name and launched a million Delena vs. Stelena debates. (NOTE: Which side are you on?) When you watch The Vampire Diaries online via TV Fanatic, you give yourself a number of options to either see episodes you may have missed... or catch clues you may have missed. It's free, it's easy and it will ensure you are part of the water cooler conversation tomorrow. Okay, fine. The Twitter conversation. We have episodes from The Vampire Diaries Season 1, The Vampire Diaries Season 2, The Vampire Diaries Season 3, The Vampire Diaries Season 4, The Vampire Diaries Season 5 and The Vampire Diaries Season 6, all at your disposal. Was Jeremy wearing a tanktop this week? Did Bonnie utter some witchy curse words? What awesome organizational skills did Caroline show off? And who kissed Elena?!? Go right ahead and watch The Vampire Diaries online so you can jump into our forums and our comments and join the debate. We'll meet you there!